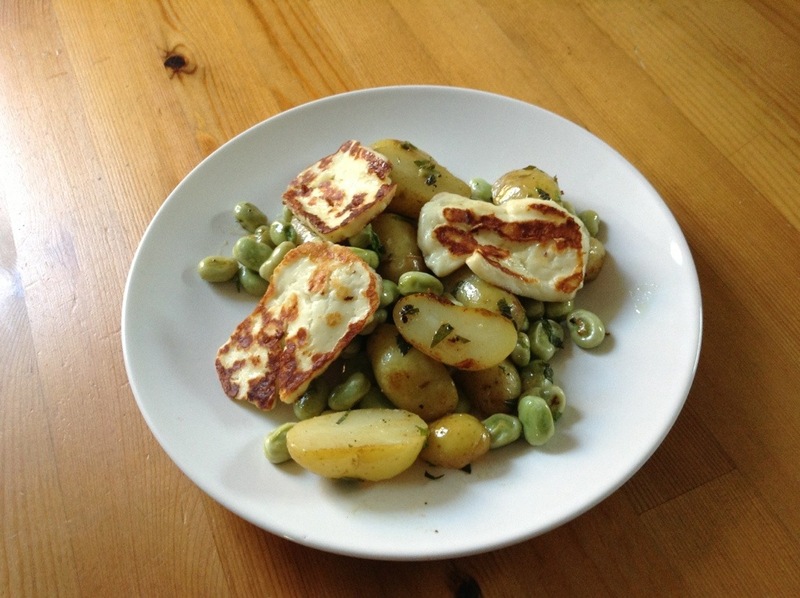 This Meatless Monday post is an amalgamation of the minted potatoes and fava beans from the first Piacere Farmer’s Market Challenge and a recipe from one of my newer Olive magazines. It’s so simple − it only has four ingredients and takes less than half an hour to make − but surprisingly satisfying and tasty. This is so simple, in fact, that it needs no recipe. 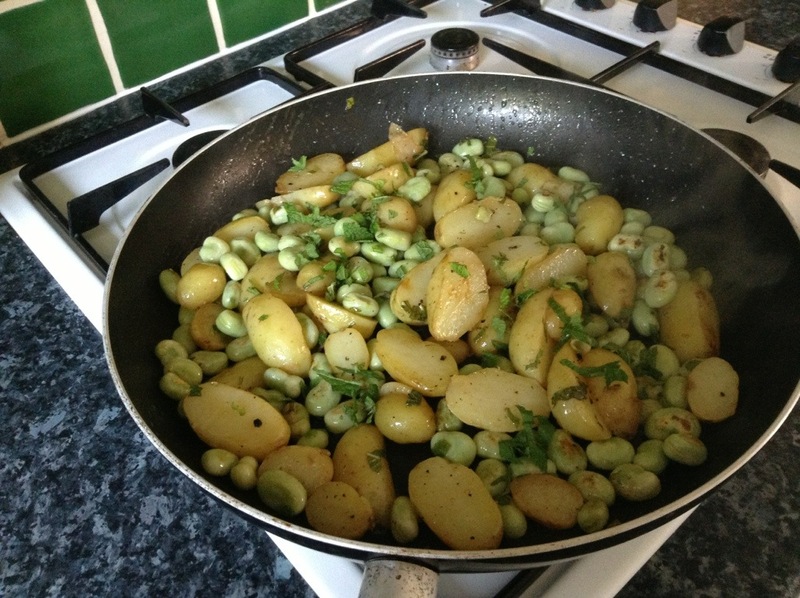 Just boil up some potatoes − I used new potatoes, but use whichever kind you like − and blanch some fava (broad) beans. 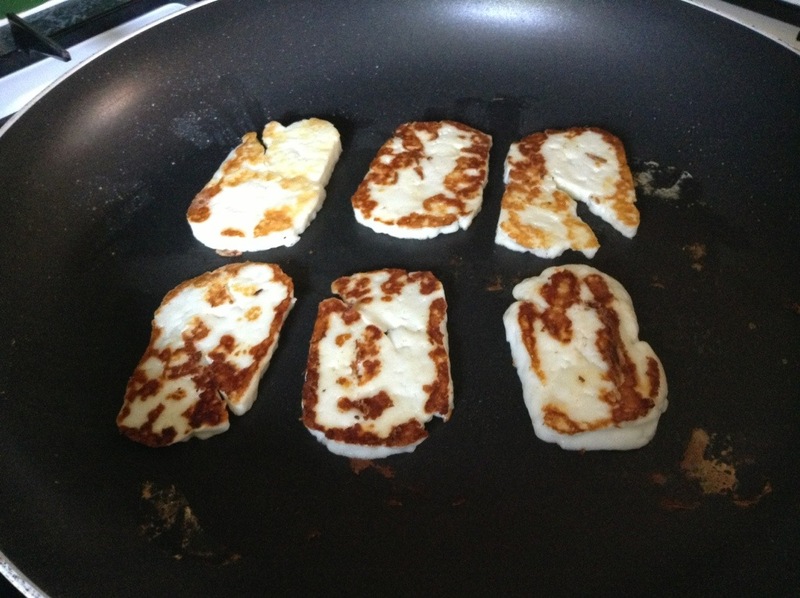 In the meantime, you can dry fry the halloumi until it’s golden brown on both sides. It has a tendency to go styrofoam-y if you let it cool, so keep it warm in a low oven while you finish everything else off. Now there’s a decision to make. The Olive recipe uses slice boiled potatoes tossed with the beans and a simple mustard vinaigrette, but this sounded like it might have been a bit insipid − I mean, where was the butter? Instead, I decided to saute the halved potatoes and beans in a little butter until they got a little caramelized. Then I tossed in the mint and seasoned with plenty of salt and pepper − because potatoes need it! If I had Dijon mustard I probably would have used some, but as I had been out of the country for about six weeks and therefore my pantry/refrigerator go-to’s were a little on the meager side, I didn’t have any so I left it out. I think it would’ve added a bit of zing which would’ve been great, but instead I tossed in a little sherry vinegar to cut through the cheese and buttery potatoes. I think this recipe could use some tweaks. It didn’t blow me away, but it was great as a quick weeknight meal which was vegetarian, relatively cheap and quick to make. Try it and let me know what you add or do differently, whether it works or not! Looks like the perfect summer dinner after a day at the beach or outside! It definitely is because its so quick and easy! Especially if you’ve just dug up the potatoes and shelled the fava beans yourself – which I didn’t. Yum! Thanks for the inspiration! I didn’t make it because it’s Monday (which it is), but because I really had the ingredients hanging around. For the tweaking, I sautéed a bit of chopped shallot in that butter before adding the potatoes (little Yukon golds) and fava beans, added that Dijon (1 tsp), and used the sherry vinegar to deglaze the pan instead of just splashing it in at the end. Other than that, just as you suggested…thank you! My pleasure! Glad you enjoyed it and your tweaks sound great!